Japanese garden and ridge at Pikake Botanical Gardens, 2003. Its gates are forever locked. The koi have died. A lonesome breeze blows through faded gardens overgrown with weeds. The waterfalls have ceased falling and even the roses have faded into wilted dreams. Welcome to Pikake Botanical Gardens at 15515 Villa Sierra Road, once one of the wonders of the horticultural world, now reduced to ashes and memories. A private botanical garden on nine acres, the project flourished from early 1999 to June 2006 thanks to the vision of Clyde and Connie Childress and the sweat equity of Vista landscape “environmental artist” Bryan Morse. 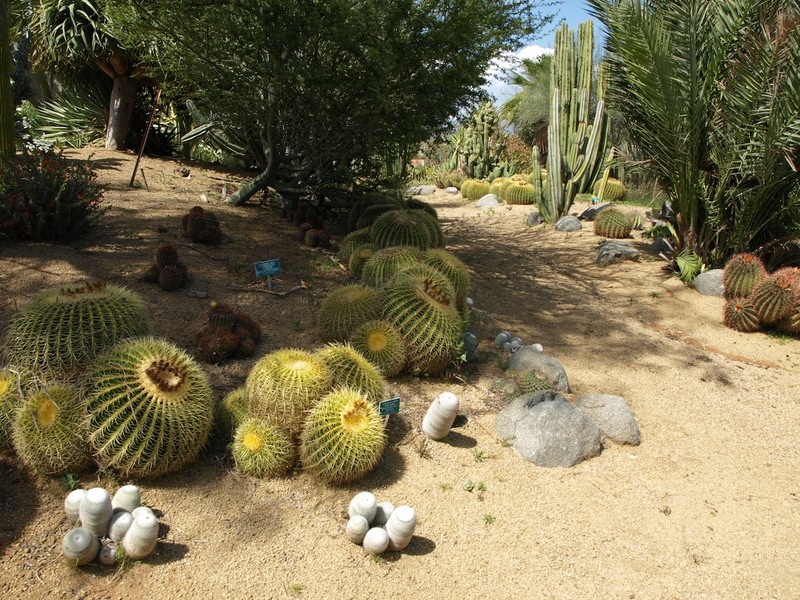 He now operates Alta Vista Botanic Gardens with some of the old Pikake landscaping in a new location. “We just wanted to do it, we could do it and we did it,” former owner Clyde Childress said this week. “I visualized what I wanted and when I was at a nursery one day I asked about a good landscape architect. They gave me Bryan’s phone number. 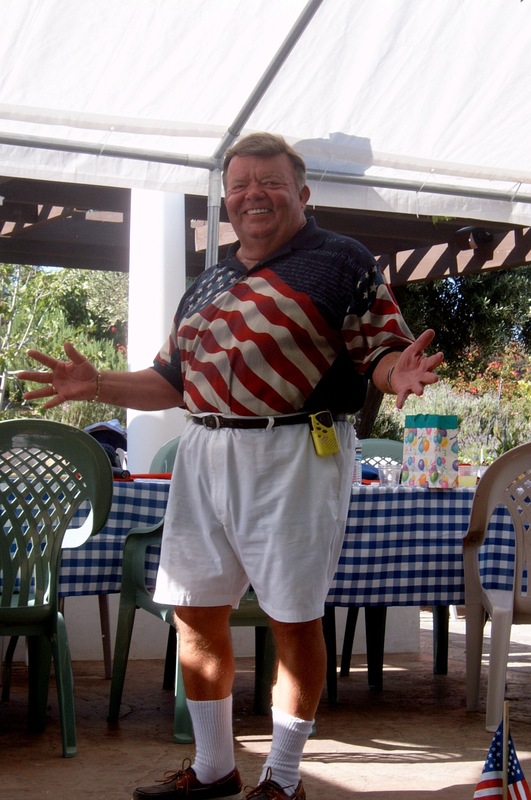 Clyde Childress at the annual July 4 party. 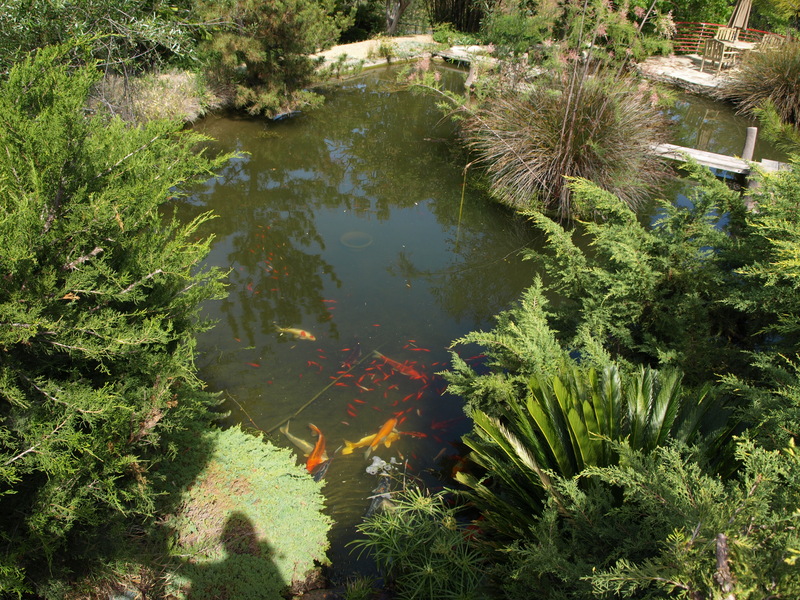 Morse recalled the fateful meeting at Vista’s Ganter Nursery where he had created an impressive demonstration garden at the time. Childress was a former Marine helicopter pilot with Vietnam War service and a Laguna Hills real state broker before buying the Villa Sierra property in 1998 for a reported $430,000. “His wife’s family owned part of the Tropicana Orange Juice company,” Morse said. With money and a vision, the project continued in earnest. 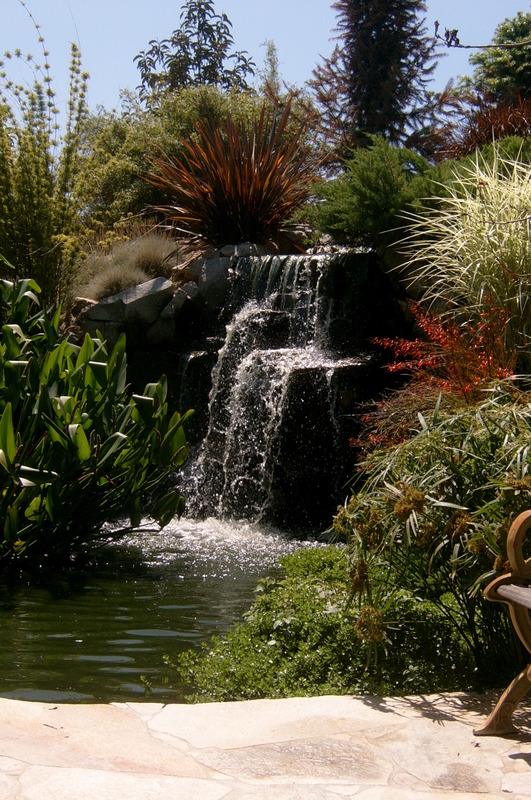 One of several waterfalls at Pikake Gardens. The Childresses named the gardens Pikake. That was the sweet-scented Hawaiian flower, Jasminum sambac, once favored by Princess Kaiulani. It means “peacock” in Hawaiian. As it happened, a favorite family cat was named after the flower and the garden was named for the cat that recently had died. So magnificent was the project that within no time it was listed on the National Garden Conservancy Tour list. At its height, the gardens attracted 1,000 visitors monthly. It hosted large fundraisers and even an annual July 4 free community party attracting visitors from across the country as well. The facility was rated with a 2,000-person capacity at its height, parking for 40-45 vehicles. While admission was free, donations were accepted. Larger groups paid $100 due to the water costs for the pumps. Manta.com put annual revenues at around $56,000 with a staff of one. The “Jazz in the Garden” party raised $80,000 for the community center with private weddings also availing themselves of the lush garden settings. Koi in 2003; they were eaten by predators later. The Protea Garden contained more than 100 varieties of proteaceae ( a unique family of flowering shrubs and trees native to South Africa and Australia), and a desert garden, focusing on desert plants of unusual shapes, form and color. The grounds contained a Pan-Asian Garden, a Japanese-inspired meditation garden; a prayer garden, employing a pallet of white flowering plants surrounding a life-size statue of a kneeling angel; an English garden, containing more than two hundred species of plants, an arbor walk, and a forest walk, according to Russell and Thomas. The beginning of the end came around 2004 as the Childresses sought to sell the property and move back East. Childress, 78, said he wanted to be closer to remaining family in his later years. They bought a 50-acre, lakeside property in Powhatan County, Virginia, a rural area west of Richmond where they reside today. The “lot” contained a 3.394-square foot single-family home with four bedrooms and 3.5 bathrooms built in 1980. The property was underwater, literally, valued at around $1 million today, withered gardens notwithstanding. As for the Li’s, the Roadrunner couldn’t find them last week. The gardens may have faded, but memories are preserved online for those who care. Morse has preserved the gardens in the clouds, a website devoted to photos and descriptions of the glory that was Pikake. It’s at http://expandinghorizons.biz/html/pikake_gardens.html. 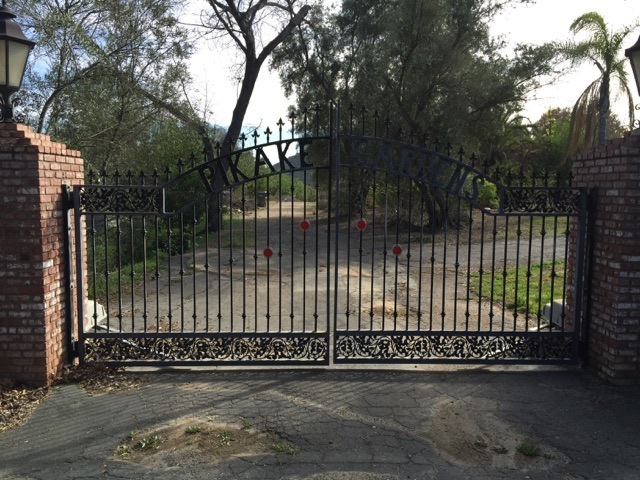 The gate was closed last week at Pikake Gardens turned desolation row. Be the first to comment on "Memories of Pikake Gardens"